Status: offline Sure seems like IF we could ever get everyone healthy and happy at the same time, we'd be a handful for damn-near anyone, no? 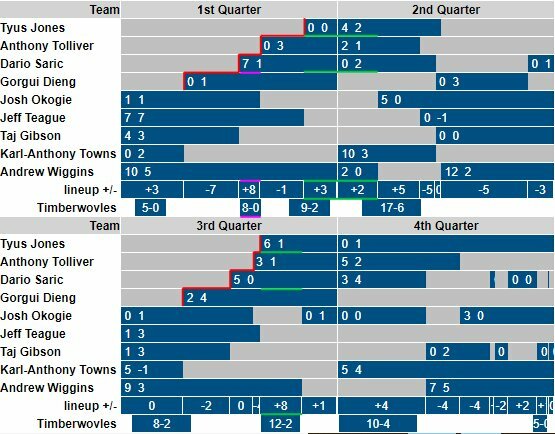 if we Wiggins would play with that effort every night we could be pretty good. Status: offline One thing I noticed during the game last night that I've seen quite often is Steven Adams is a really good guy. He's physical as hell and just a beast, but there might not be a more safety conscience big in the game. I've seen multiple instances where he either catches or holds up a player to prevent a nasty fall (he passed taking an easy layup once to catch a Plumlee that was heading for an ugly fall after fouling him). He's also the first guy over to help anyone up - teammate or opponent. Last night he helped up Taj and you could hear him keep asking him if he was OK.
Dude looks like a monster, but his sportsmanship is off the charts. One thing I noticed during the game last night that I've seen quite often is Steven Adams is a really good guy. He also causes KAT more fits than almost any defender......the reason Wiggins has been so good against OKC is his matchup is so much better than KAT. Status: offline A very minor but revealing tidbit about Thibodeau’s approach concerns the lasagna dinner Taylor holds for the entire team at the end of every preseason training camp. It is a traditional feast that Flip Saunders and his coaches and players never failed to mention as being a much-anticipated checkpoint on the season calendar. For Taylor, the billionaire who, however corny, loves the notion of community engagement and a familial atmosphere, it is a cherished get-together. According to a couple of reliable sources, Thibodeau has been a no-show at these gatherings. DL should the Wolves get the Shooting Coach back on staff (that was released)? No idea if he's the guy, but we definitely need a shooting coach. He also went out of way to state that Wiggins was not to blame for the Noel play. Just an unfortunate play but not dirty. Wiggins took it to the rim like a man. Noel got in his way and paid the price. I want to see Wiggins go to the rim like that every time. 3-1 since Covington was in a game. Finally got time to look at the gameflow from last night and wow, it's entirely unlike anything from the past 2 years. Saunders never made a single block substitution that Thibs made all the time. Status: offline Basketball isn't hockey, never been a fan of the "line change" philosophy of subbing. Status: offline Hard to believe, but this time next week, Wiggins will be the #2 scorer in Wolves history. Well, given the Wolves' history, maybe it's not so hard to believe. Hard to believe, but this time next week, Wiggins will be the #2 scorer in Wolves history. Sam Mitchell is one of my all-time favorite Timberwolves, but its absurd he's stil 2nd all time in points and 4th all-time in rebounds. And 2nd in games played and minutes. Status: offline That one's really surprising, because we've had some pretty decent PGs and a couple of coaches who prized passing over the years. Status: offline And in virtually every meaningful category Garnet still better than the next 2 or 3 combined. Status: offline Troy Hudson and Rashad McCants still in the top ten in made 3's. Sad, really. And Wally in the top 10 in assists. . Would not have guessed that. Jim and his family are good people. He and Muneke are the best people in the organization and they both came to Tim’s funeral and both have been really good to the site over the years. I know that the Thibs regime put a lot of pressure on the announcing crew and I thought Jim handled it about as well as one could. It’s hard to explain how crazy the last two years have been and I’m glad people are starting to talk about it.